MEMBERS OF THE EAST PIERCE WATER RESCUE TEAM responds to emergencies on the many bodies of water in the area and provides surface, dive and swiftwater services. 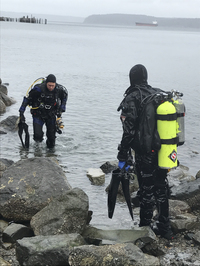 Team members gain hands-on experience diving at Lake Tapps and the Puget Sound, and practice swift water rescue on the White, Puyallup and Carbon Rivers. Together they review preplanning and organization, personal safety equipment, swift water dynamics and hydrology, and medical considerations in water rescues. They also practice self-rescue techniques, shore-based rescues, in-water contact rescues and the role of watercraft and helicopters in swift water rescue. In addition to dive and swiftwater rescue, the team is prepared and equipped to respond to ice and flood rescues. Working with our neighboring jurisdictions is imperative. The team trains and responds to mutual aid calls with with Orting Valley Fire & Rescue, Central Pierce Fire & Rescue, Valley Regional Fire Authority, and Pierce County Sheriffs Department. The Water Rescue Team Leader is Firefighter Jay Smith with assistance from Lieutenant Will Poe and Lieutenant Troy Sterrenburg. Watch this video to learn more about the Water Rescue Team.